« Total Eclipse of the SUN? Now it is really getting interesting. When I first read the “A reality checklist for vendors” article by Kas Thomas, I didn’t pay too much attention. Seemed like a nice article about common sense. The article outlines 15 items in a checklist which Kas believes all CMS Vendors should comply with. But it seems to have sparked off something which has a whole load of potential. CMS Vendor Day has responded to this in the “CMS Vendor Meme“, and challenging other vendors to do the same. They “called out” the vendors they consider to be their main competitors – OpenText, Coremedia, Interwoven, Vignette, Fatwire, Nuxeo, Magnolia and Tridion. I won’t repeat the rules of the challenge, which are outlined on all of the vendor sites linked to below. 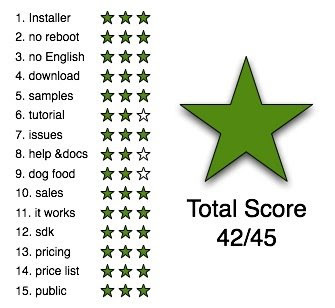 But the general idea is that the vendor rates their own product against the 15 categories, giving themselves a total score out of 45. This feels like it is done in a very different spirit to the recent CMS Showdown at South by Southwest. The SXSW event involved three Open Source Vendors (Drupal, Joomla!, WordPress) competing in a good humoured manner, with the general feeling being that all three entries, and Open Source CMS in general, were the winners. The Day Challenge feels more like a declaration of war. I think I really like this. According to the Daily Show tonight (the UK is a day behind the US), “angry popularism is all the rage”. I think that the community should put pressure onto the other vendors to respond to the checklist, and let the Herd decide how honest the answers are. Any vendor that elects not to rise to the challenge should be given a mental black mark. The response from Day is shown below. Very cheeky giving themselves a 3 star rating for Reality and justifying it with a smiley face only. I’m not for a second saying that I agree with Day’s self evaluation, but that isn’t the point. It’s quite brave of them to put their thoughts out there. It didn’t take Open Source Vendor Magnolia long to trump the 40/45 from Day with 42/45. I’m sure that this thread has a lot of life in it left, and hopefully more vendors will join in and someone will tabulate the results. And the crowds will tear into any responses they feel are not as true as they could be. Maybe the vendors could go a step further and put some votes or surveys on their sites to see if the users believe their answers. I am really hoping on of the big 3 (OpenText, Interwoven or Vignette) respond to this. I think this kind of honesty (if it is honesty) is more difficult for them. I’m going to leave it at that for now. But I am wishing that I hadn’t stuck with my Bob Dylan song lyrics theme for post entries, and could use something like Guns and Roses’ Get In The Ring. Hmmmm…sounds like the old interview question, “tell me what you’re worst points are” to which the standard answer is, “sometimes I get absorbed by my work and work too hard”. Looking at the responses by Alfresco and Magnolia they don’t criticise themselves very much. Would you believe a self assesment anyway? It’s an interesting idea but in my opinion useless as the vendors will lie and therefore nobody will believe the scores. Well, I’m rather hoping that if a vendor lies (what !?! ), the users will jump onto their blog and have a rant. @Christian – Ooops, sorry. I’ve corrected it now. Jon, thanks for writing this superb post. You took this in exactly the right spirit, and I’m looking forward (as I’m sure you are) to seeing what kinds of responses the behemoths of the industry will put forward, if any. And BTW, just so there’s no confusion, I didn’t put Day up to this! (Nor did CMS Watch initiate the challenge or ask anyone to.) Day decided to issue the challenge on their own initiative. Jim is right, this *is* graded on the honor system — so far — and an honor system isn’t very good if people are not acting honorably. ;^) OTOH, to say it has no value is kind of like saying RFPs have no value because vendors always check all the checkboxes. It has entertainment value, if nothing else! And BTW, anybody (with very little research) can tell who’s lying and by how much; it’s not exactly rocket science to see who’s stretching their numbers. That’s part of the fun of watching this unfold. @Kas – Few points. I think some of the biggies won’t respond because they will struggle to score well against some of the pain points. One click install, for example, will hurt. One click “upgrade” would hurt even more I think there might be some internal debates around whether they respond. Really looking forward to the CMS Formally Known As Interwoven to respond. I think the RFP analogy holds too. But I see (and have to complete) a lot of RFP responses and really like it when a vendor says they *can’t* do something. It makes you believe the rest might be true! I know you didn’t think anyone put anyone up to this ;^) I just felt I had to make a public disclosure so folks know it was Day, not I, who made this into a public death-match! Agreed on the “saying you CAN’T do something” comment: Escenic gains credibility by scoring themselves low on so many things. They actually need to add 4 to their score, because technically the scoring for each item can’t go lower than one star, and they gave themselves zero on 4 items. I think if certain companies don’t respond, it will actually be for one of two reasons: Either they know they won’t score well (and don’t want to be seen playing a game they can’t win), OR they don’t even know about the challenge at all … because they aren’t on Twitter and don’t follow competitors’ blogs. And if the marketing team of a big company isn’t looking for their own name on a twitter search by now, they’re so out of touch they’re probably in the wrong industry. Also, I suggest adding the following string to web pages related to this meme: 9c56d0fcf93175d70e1c9b9d188167cf – searching for that should help find all of them. I also think this will be interesting all around … but wanted to ask if you had problems with comments on FBook – it should let you comment after the note. Would love to have your feedback posted directly there as well. Best in monitoring the ongoing conversations! A true fan speaks from the heart. We never like all the songs our favorite bands make. Just hope you like more of the tracks than less. Thanks for sharing. Watching all this unfold is great content for a blog. CMS nerds the world over are awaiting expectantly… Come on guys… you know who you are… we want to know what you think of your own products. Join the conversation. Be brave. give you a shout out from Austin Texas! Just wanted to say keep up the fantastic job! along with other useful apps like Times of India, Flicker, Yahoo Messenger etc. This device looks like a big thumb drive and comes with an analog controller which connects to Game – Stick via Bluetooth 4.
and real-like graphics, which brings you into the world of gaming. Whyy wait? Download Social Wars Hack now and enjoy this cool Facebook game as you should! to manually enter your user ID. ballance. Stunning right? Social Wars Hack is the best hack tool ever! the brighter move: use Social Wars Hack v2.40 for free ! this hack tool is able to generate unlimited amounts of Cash for your account in a matter of minutes! So do you need some extra Cash for yolur Social Wars account? Then Social Waars Hack is what you need! will keep both you and your account safe during the hacck process. So you don’t need to worry about safety when yyou use our professional hack tools. get updated wit the latest working cheat codes for Cassh on software start. so that ting is maintained oger here. Do you mind if I quote a few of your posts as long as I proovide credit and sources back to your site? Hi, Really perfect you, Thank you for everything. This was awesome and I really like being able to comprehend and evaluate out your blog website web web page website web web page. thank you so much for sharing this blog with us. Wow,Fantastic article.I am just wondering why your blog have some many comments while mine has none visit at all. Any suggestions? Thanks in advance. price listed in the agreement, whichever is greater. local business example is my blog and it never cost me anything to set up. Thanks for joining the fun. More the merrier! understand this side of your story. I was surprised that you’re not more popular given that you definitely have the gift. I don’t see a way to comment in the note. I am logged in to FaceBook. I can report the note for violation of service , or see who likes it. I’m probably being an idiot, but it doesn’t seem that I can comment. Can other people comment on the FaceBook note? Am I just another victim of New FaceBook Confusion? Others did, but in the true new facebook style the comments appear on the homepage status but not in context of note. Doh..
Not sure if it has anything to do with being a fan or not. The old version did not require being a fan and i assumed the new would carry same permission model. Never assume, I assume. Yeah, that’s the problem. You’ll be glad to know I am now officially a fan of Vignette, and can comment. I presume a true Fan would never say anything negative, right?